How do you know if a breakfast is too pretty to eat? I am allll about the overnight, easy-to-transport, grab-with-a-moment’s-notice breakfasts right now. Even if the air is cooling down and it’s chilly and there are pumpkins all over our front porch, I want cold breakfast. It’s like coffee. Give it to me iced or turn the other way. A few years ago (um, whoa, almost FIVE years! ), breakfast quinoa changed my life. While only slightly more time consuming that throwing together a bowl of cereal (but about the same as a fresh bowl of oatmeal), the satiety it gave me seriously blew my mind. I can often eat a bowl of breakfast quinoa with fruit and almond or coconut milk and not be hungry for five or six hours which is crazy unheard of for me. And it has awesome texture, which is a must must must. And! You can make it whatever flavor you want. Possibly the best part due to my bored-all-the-time millennial brain. So I took that breakfast quinoa and made an overnight version. Add milk, add yogurt, add all sorts of flavors. Maybe a touch of honey. You’re good to go. … plus the cooked quinoa, almond milk and greek yogurt. And then… on top? More pepitas. Chopped persimmon! PUMPKIN BUTTER SWIRL. Apple slices, honey drenched walnuts and a tiny sprinkle of granola. I’m definitely not the person that constantly loses their mind over pumpkin, but I LOVED the pumpkin butter swirled down into this right before breakfast. It made it taste so rich and warm, even though the jar was cold. And the persimmon! I’ve never posted an actual recipe with persimmon before and it’s not like this really counts, since I chopped it up and threw it on top of something. But I like it. I was afraid of the weird mouth feel that people talk about – none for me. I’m a persimmon lovin’ fool now. And this will make some of you verrrry happy: NO chia seeds! You can absolutely add some into the quinoa, but I left them out. Frankly, I was out of them because someone dumped a new two pound bag all over the floor a few weeks ago and I haven’t recovered from cleaning every.teeny.little. seed out of the crevices of my life. This kind of breakfast makes up for it though. Almost. To make the cinnamon apples, place the chopped apples, cinnamon and cider in a saucepan over low heat. Cook, stirring occasionally, until the apples are soft and golden. Remove and let cool. In a large bowl, stir together the quinoa, milk, yogurt, honey, cranberries, pepitas, coconut and cooled apple chunks. Scoop the mixture into jars or bowls and refrigerate overnight (or at least for 4ish hours). When ready to eat, remove it from the fridge and add a little extra milk if you’d like. Load it up with toppings and you’re good to go! This looks so yummy and I want to eat it , can I heat it up? hmmm i don’t think i’d reheat it up (after the quinoa is cooked and cooled) only because of the yogurt and milk! but you could make quinoa fresh and mix it with some milk and the toppings!! oh em gee yes! Love that you used persimmon, too. It’s so underrated. Thanks for making your blog so easy to read, exciting, and creative. Hope the rest of your day is amazing! It really is almost TOO pretty to eat. The persimmons sold me. I was already sold on all of it, then you chopped up the persimmons and I almost fell over. What is up with men cooking in the middle of the night?? My S.O. does this almost nightly!! I’ve never tried persimmons… am I missing out? where can I find them? what do they taste like?? Oh gosh, I have so many questions. But, I’ve also never had breakfast quinoa and that is something I will be changing right away. I hope the garlic is helping you feel better! i found them at my local grocery store – i’m not exactly how long they are in season! i’m also not too sure how to describe the taste – almost like a sweet tomato?? i love that word so much too! I love this! 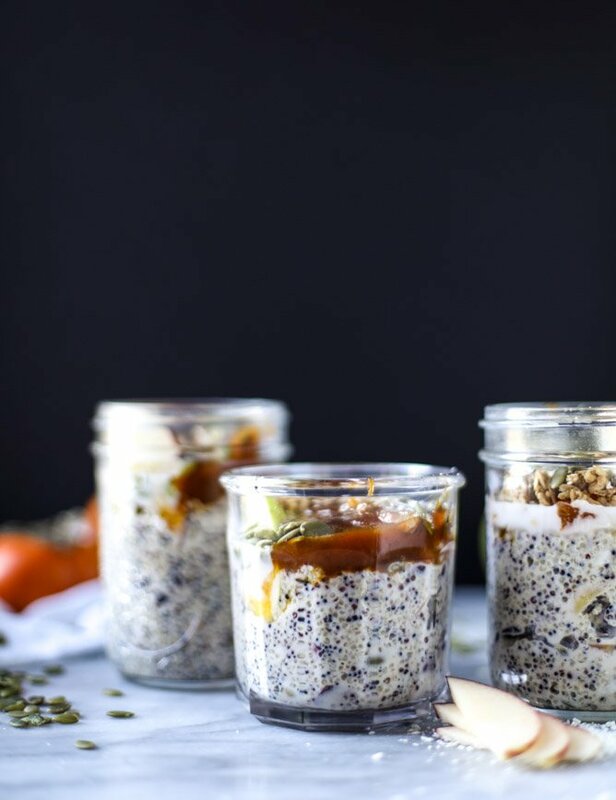 I’ve never had quinoa for breakfast before so this is definitely something I want to try! And I love that you used persimmons! I don’t see them included in recipes a lot., but I have a ton at home. the chai seed spill struggle is real. what nightmares are made of! I’m all about cold breakfasts and coffee year round, so YES to cold breakfast quinoa. I’ve been wanting to try to make an overnight quinoa recipe for a while now (ain’t nobody got time to cook quinoa in the mornings). Looks like I don’t have to now since you did all the work for me! Pinning for the future – this looks devine! I’ve been following your blog for quite some time now, and I love your content and the lessons you share with your readers. Every time I read a post, I feel like I’m able to take a single, clear lesson away from it, which is why I think it’s so great. I will definitely share your content with my readers. to the next level I’m your girl. I specialize in top quality branding services to increase revenue for you and your company. So many cool flavours in there! This is definitely a great way to begin the day! Fall flavors are my absolute favorite! Love the combo here. Can’t wait to get my hands on a good, ripe persimmon… and pomegranate! Tried the recipe, tastes delicious and makes me feel good that I ate something healthy in the morning. this looks so good! if i have raw pepitas, how long/what temperature do you suggest i roast them? hi! i would just toast them in a skillet over medium-low heat and toss/stir often until they are fragrant and kind of golden!